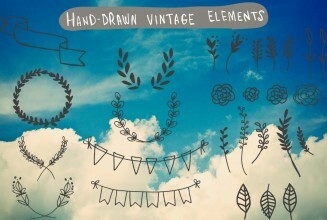 Set of 30 charming illustrated objects (wreaths, ribbons, flowers and leaves ) for your personal designs and illustrations. Free for download. File format: .png ,.ai for Photoshop or other vector software. Tags: badge, doodle, drawing, flourish, flowers, hand drawn, header, illustration, invitation, logo, retro, ribbon, text divider, vintage, wedding.